Why did you start your business? What was the spark? Tell us your story. I like to say that my business was a happy accident. I have always loved lettering and would often make little chalkboards or signs for friends. A couple of those friends encouraged me to sell them at a local holiday boutique and just 2 weeks before, on a whim, I decided to just go for it! I had no idea how well it would go. I was beyond thrilled when we sold out of a ton of our signs! From there, we did a few more boutiques and that could have been it.... but as I started spending more time lettering, learning new skills and techniques - it really did change my life. I was going through some really hard times and lettering became a meaningful outlet as well as a way to focus on positive words that really kept me doing it. I would post my lettering on Instagram and that community organically grew. That led to some custom work and eventually teaching in-person workshops which was what I loved the very most. The sweet community we had online wanted access to these courses so then we created online courses this year as well as The Creative Lettering Journal which is a guide to learn lettering in a meaningful way where the words you're writing will uplift and inspire you. This year has been so incredible, it is tough to pick just one thing! A huge highlight of my year was definitely creating the Creative Lettering Journal and getting it into peoples' hands. I had a vision for this book in January and it developed throughout the year. I knew it was going to be sharing my lettering passion in a way that aligned with my core purpose of helping women feel inspired to live intentional lives. To go through all of the stages from conception, to sketching and production and selling - it's been a huge labor of love but there's nothing like having it be so well received. What has been the hardest decision for you to make in or for your business? One of the hardest decisions for me to make in my business was to do LESS and learning how to say NO. After attending the Creative Founders Conference in Pensacola in March, I knew I needed to stop doing all custom work to really be able to focus on my real passion. I also loved teaching in-person workshops but they were demanding and I had to really cut back on them if I wanted to be able to create the lettering journal as well as the online courses. It's been so hard to sometimes feel like I'm disappointing people but in the long run I am blessing SO many more people by saying YES to my true passion as well as YES to more time with my family. I want them to know that they always come first. Who or what has inspired you the most from the creative business owner community? From whom do you seek advice? There are so many inspiring women in this creative business owner community! It's so hard to choose just one but I would say Lara Casey. She is so real and genuine and there is no question about why she does what she does. She has created high quality meaningful products and a beautiful community that I love being a part of! I have an incredible network of support to seek advice from! I have my accountability group that I met at the Creative Founders Conference - Suzi Istvan of SplendidlyCurious.com, Hope Johnson of TheLittleBlueChair.com & Amy Braswell of PaperFinch.com. We have calls every other week or so and they have amazing advice and support for me. I am so grateful for them! Success for me is when someone tells me that lettering has made their life a little brighter & more joyful. To see people using their creativity and creating inspiration with it makes me so happy. My goal is to help women feel loved, understood and inspired to focus on what really matters. When I can see that happening, it makes my heart sing! What’s in your future? Tell us what you have up your sleeve. 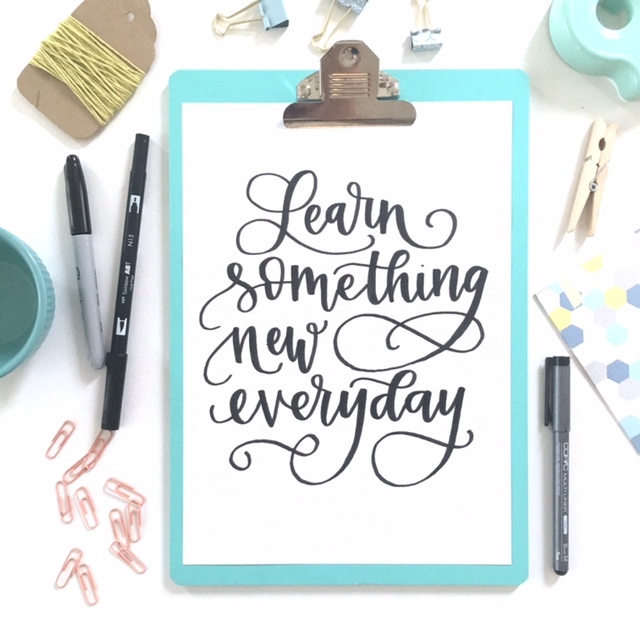 This next year we will be coming out with another online course as a follow-up to our other lettering classes. It will be an intermediate course all about composition and flourishing that I know our students will love. I'm hoping to create another Creative Lettering Journal and possibly some resources to help other Lettering Artists beginning in their businesses... So many possibilities!! 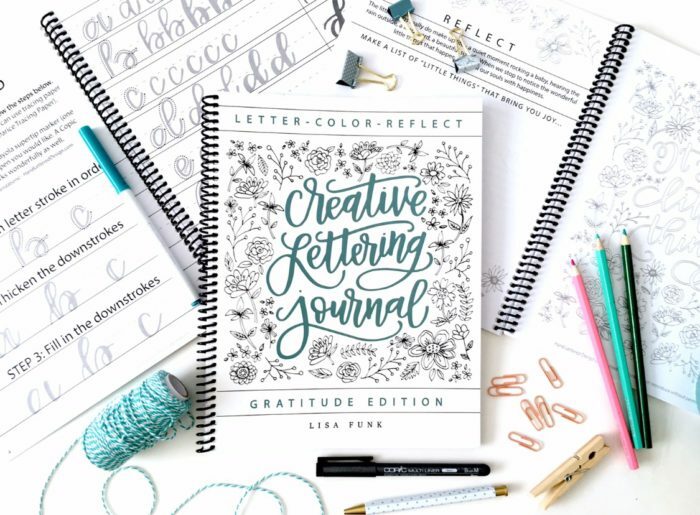 We can't wait to see what's next for Lisa and Hand Lettered Design! Keep up with her on Instagram, her website, and on Facebook.